Are Personal Loans Ever Right For You? Is a personal loan ever the right choice for you? I’m not talking about payday loans, or those fun (or not) personal loans that happen in the back alley of a pawn shop, but honest to goodness personal loans from a bank. Maybe you’ve heard them referred to as an unsecured loan. A personal loan is usually called an unsecured loan because it has no property securing its repayment. Unlike a car loan, mortgage, or other secured loan, there is nothing for the bank to come and repossess if you should default on the loan. It’s a loan based on your credit alone, and your personal ability to repay it. Because of the unsecured nature of the loan, the interest rate is usually a bit higher than a secured loan. And, because of that higher interest rate, personal loans are generally frowned upon. The only way to get a “loan” at a higher rate is to use a credit card. Credit cards, actually, are a form of personal loan. Think of them as a personal line of credit. Are there good reasons to get a personal loan? The answer, much like most other things related to personal finance, is that it depends. Some people will tell you that they are an absolute no-no. Don’t do it, under any circumstances. I tend to lean a little bit more towards the middle. I don’t think you should use them every single time you need a little bit of money. That can get a bit cumbersome, and can lead to bad credit practices. But, I also think that there are times when a personal loan can be beneficial. When I used a personal loan. I’ve borrowed money from a bank in the form of a personal loan. Once. It was the only time I really needed to do it. It was near the beginning of our journey towards getting out of debt. A journey we are still on, mind you. After several years of very slowly building credit, we were on the right track. And then stuff happened. We needed some money to help pay for some bills. Without anything to secure a loan, I was able to get a small loan from my local credit union. It helped bridge the gap between what we needed to keep our bills current, and save our credit, and getting behind on stuff. It wasn’t a huge loan, and it wasn’t any more than we needed. Our usage is one way that I think that a personal loan can be a good thing. There are other ways that I think they can be helpful. Using them smartly, and only taking what you need is always the rule, though. Using them to help bridge gaps in funding for capital investments in your company, paying off a higher interest rate credit card, and even for a little bit more to help pay for home improvements. Obviously, using them for things that can be considered an investment. Either an investment in the traditional sense in that it returns some amount to you, or investment in that it saves you an amount. What about you? 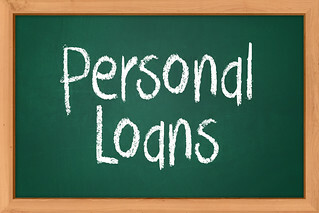 Have you ever borrowed on a personal loan? Do you think people should? Your experience seems like the right reason to get a personal loan — when you have no other options. True, when it comes to debt, all else equal, unsecured is better than secured, for obvious reasons, but you are likely to pay a higher rate for it. That said, because you’re talking to a human, you might be able to bridge that gap because a credit score has difficulty taking your job and wealth into account. Good luck! I think personal loans should be considered, but only in dire situations. I think you used them correctly and didn’t use them for frivolous purchases or expenditures. Personal loans are just that, personal. Each person must make the decision whether or not they work for them. I used to have an unsecured line of credit. I used it for investments, but over the years I decided to make it secured to lower the interest rate. It does not cost me anything until I use it. I agree with Grayson. Loans should be used in dire situations only. But there are still decent loan deal out there, just don’t get sucked into a bad deal in a time of desperacy. I also used a personal loan from a bank once in the 80’s. Unfortunately, I do have a lot of unsecured debt through credit cards so I suppose that might qualify according to your article. Instead of taking a personal loan, I would apply serious gazelle intensity to my monthly budget, get a part-time job, and sell some of that STUFF that is cluttering up my house. Then I would be happy I wasn’t living upside down, more appreciative of my time off from work (sparsity forces me to make more meaningful use of the time I have left), and regain my sanity because my living space is spacious again (clutter makes me crazy). I think a personal loan is better than wracking up credit card debt and it’s better than an equity loan. It may lead you to get out of credit debt sooner if you have a good rate. And, it’s insurance for controlling your finances.